Cookbooks line the shelves in my kitchen, and recipes clipped from magazines form slippery, teetering piles on the dining-room table. Which is kind of funny considering that 99 percent of the time, like many a home cook in charge of feeding the family, I resort to the same tried-and-true recipes (or tired-and-true, in the case of some of them). Add to this the fact that one family member (She Who Shall Not Be Named) is not on speaking terms with onions, peppers, celery, tomatoes (if they're not in sauce form), greens (if not food-processored into specks and blended into soup or sauce), lamb, tofu, most fish other than salmon, nuts, and...oh, anything she's not "in the mood for" on a given day, and the menu shrinks even more. Still, one gives it the old college try now and then, with its roster of hits and misses. Hence the good, the bad, and the ugly of home cooking. A cake. Rarely is a cake Bad or Ugly (though, when it comes to Bad, I can remember a disastrous cheesecake baked with Sweet & Low made by my German grandmother's roommate, the mean Mrs. Schulkopf, whom my dad kept mistakenly-on-purpose referring to as Mrs. Holzkopf, or "wooden head"...and as for Ugly, look no farther than Cake Wrecks). Good is the very essence of this simple Bundt cake, which not only tasted delicious but also obligingly slipped out of an intricate Nordic Ware pan with all its peaks and valleys intact. Anyone who has ever begged, pleaded, and wheedled a Bundt cake to come out of its pan will appreciate the simple prettiness of this baked good. Usually half the cake comes out with a plop, leaving the rest to be pried out with a knife. I once had to blow-dry the outside of a Bundt pan to get the cake out and since it was going to attend an auction to be at the dessert table, many repairs with frosting and powdered sugar were required after it stopped sulking and crept out onto the serving plate. After struggling with unsticking cakes stuck in nonstick pans (even resorting to thoroughly greasing the dratted things with butter and Crisco and liberal lashings of flour), I finally got in touch with Nordic Ware (which still actually employs people in the United States to answer its emails, people who are free to depart from a script and really chat with you). 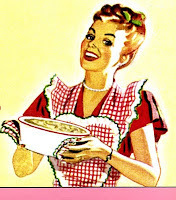 A lovely spokeswoman there informed me that Pam baking spray (the oil and flour one) is the only way to go. It worked a treat. Plus, she sent me a free nonstick pan to compensate for my frustration, something I certainly didn't ask for or expect. Wow! Now that's customer service. The Bad was born of ultimate thrift and planning on my part. There were a lot of heels from whole-grain loaves of bread kicking around in plastic bags in the bread drawer. In this household, these heels would remain in the bread drawer yea, verily, unto eternity if I, apparently the only one with opposable thumbs, did not pick them up and put them into the food compost bin (or resign myself to weary morning after weary morning of having toasted heels of bread for breakfast). Unfortunately, I heated them the eensiest bit too long. Oh well, they're bread crumbs; who cares. I decided to use the lot when I industriously made two meat loaves a week later, using my mom's old recipe but substituting ground pork for beef, as I always do. The proportions of bread crumbs to meat weren't exactly as dictated by the recipe, but meat loaf is forgiving, right? And look! How thrifty! And I can freeze all those leftovers for future meals! Well, meat loaf is forgiving...up to a point. The taste of over-toasted, very strong-tasting whole wheat bread crumbs overpowered everything else, and the meat loaf was dry, to boot. Or, as my family felt, "should be booted"--into the trash. My daughter took one bite and, being of unvarnished editorial opinions, shouted, "Yuk! Ugh! Bleh!" My husband, being British, stiff-upper-lip, and understated, merely said that he preferred my "other recipe," but quietly ate his meal with lots of ketchup. I jammed the leftovers into the freezer, distraught at the thought of wasting all that food. And--shhh, don't tell--pulled it out a week later, shoved it all into the food processor, and went through the ridiculous process of turning meat loaf back into ground pork. Then I mixed it all with two bottles of Prego traditional pasta sauce, heated it up, and served it on spaghetti. Nobody was the wiser; they thought it was Bolognese sauce and came back for seconds. Shhh. The Ugly is so Ugly I cannot share the pictures of it, and in fact I deleted the images from my computer because they were so horrific. I am happy to say, however, that the Ugly was also very Delicious. It was a Beef Wellington made from a recipe in Jamie Oliver's book Jamie's Food Revolution, with pork substituted for beef. It was a smashing success. It even obligingly stored itself in leftover form in the freezer and tasted fine after thawing and reheating. However, it definitely wasn't photogenic. It looked scrumptious on the plate, but the pastry had split open to reveal the filling, so when I uploaded the photos and looked at them on the computer screen, it appeared as if I'd been taking photos inside a veterinary surgeon's operating room. I have spared you this grisly scene. 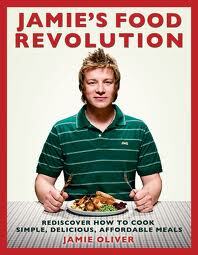 Instead, feast your eyes on the cover of Jamie's book, and the adorable visage of Sir Jamie himself. Ha ha - I loved this post! I am still chuckling. Now I know what is wrong with my darling family. No opposable thumbs. And I am impressed with your firm's solution to the sticky-no-stick pan (oh, I have those). Wonder if we can get that stuff in the UK? I am flabbergasted to discover that Pam is not sold in the UK (visited some online chat boards in which people in the UK were asking about this). I did find the regular Pam spray (not the flour-added baking one) here: http://www.usafoodstore.co.uk/Pam-Original-Spray-p/pam6oz.htm. It lasts a long time, though, if you only used it for sticky nonstick pans, perhaps adding lots of flour the plain spray would work. Couldn't hurt. If you try it I will join you in your newspaper walk of shame, and then I might get extradited back to the States for about a million years. I have just looked Pam up, and the absolute seller for me is its nail varnish drying capacity. Truly, it is a miracle substance. Nail drying capacity?? This I did not know. I wonder what else it can do. I had no idea Pam was the duct tape of the spray-oil world!